On February 19th, 1949, N79065, a Seaboard DC‑4 named Singapore Trader departed Idlewild on what would become a widely‑reported flight transporting animals. Eastbound, the aircraft carried boiler tubes for a tanker in Badan, Iran; and a rudder stock, motor, and various crates for a tanker in Singapore. The westbound flight carried 133 animals weighing 13,000 pounds from Singapore and Bangkok to Idlewild. They included 116 Java monkeys, 4 gibbons, a 23‑foot, 140‑pound python, 4 leopards, including 2 cubs, 2 Asiatic Golden Cats, and 6 baby elephants weighing about 1,500 pounds each. 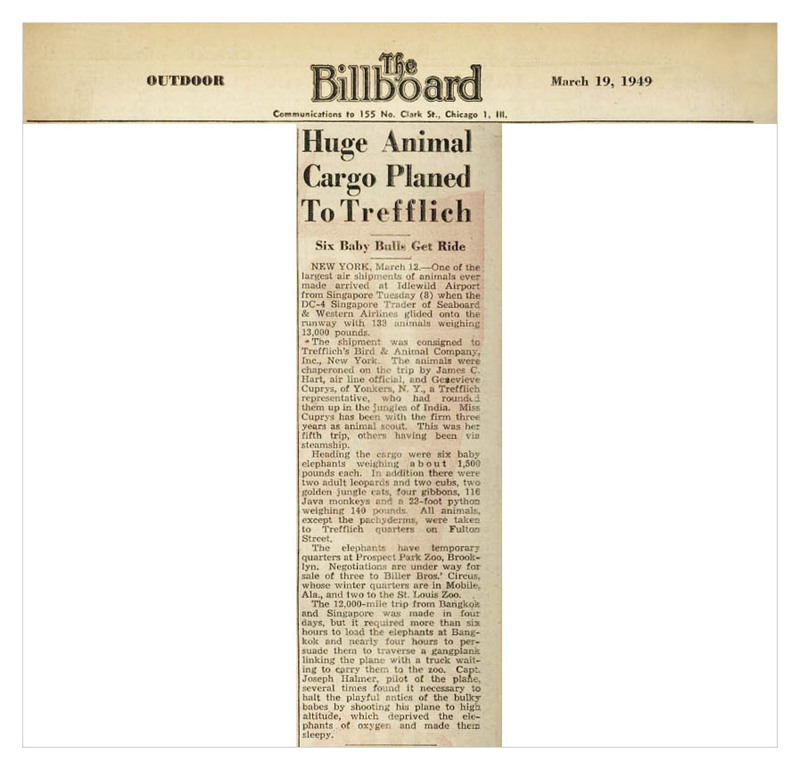 The shipper was Trefflich's Bird and Animal Company, Inc., a well‑known animal importer and dealer in New York City. When the animals arrived, the smaller animals were sent to Trefflich headquarters on Fulton Street in New York City. The elephants were sent to the Prospect Park Zoo in Brooklyn, pending sale to zoos and/or circuses. The aircraft and crew returned to Idlewild on March 8th, 17 days after they departed. They flew 24 legs, totaling 23,880 miles. They spanned 177° of longitude, almost halfway around the world. The layover points included Singapore, Bangkok, Karachi, Damascus, and Brussels. The same crew flew the entire trip. *DC-4 aircraft did not have a flight engineer station. Seaboard's DC-4s carried a mechanic who was called a flight engineer. Information derived from story in the April 1949 issue of SEABOARD AIRTRADER, an early Seaboard newsletter, and from a newspaper article.